This licese supports 4 Light-O-Rama Cosmic Color Ribbons or 600 channels. A S3 or higher Software Suite license is required to use the SuperStar Add-On. The SuperStar Sequencer is a new approach to light programming. 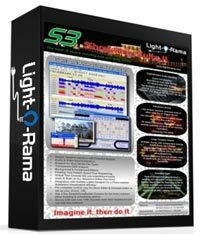 Think of SuperStar as a "front end" to the Light-O-Rama ShowTime Software Suite. A series of effects are created and played on your computer screen until you get everything just right. Export the SuperStar sequence to a sequence, connect your Cosmic Color Ribbon(s) and/or other RGB devices and get ready to dazzle the world. How can SuperStar save time when sequencing? Think of a show much like the way cartoons were made in the good old days. Each second of motion you saw on the screen was really many individual drawings, each shown only a fraction of a second but fast enough so your eye didn't realize they were a series of still pictures. Each picture (or cell) was slightly different than the one before. Now the truth is out. Animated cartoons or nothing more than thousands of individual cells. Creating scrolling text with lights is very similar to making a cartoon. Each cell you see in a show is the text in a slightly different position. You can certainly do this manually but SuperStar makes it easy. Type in your text. Tell SuperStar where to begin scrolling, where to end and how fast. SuperStar uses the power of the computer to create all the individual cells while you twiddle your thumbs. Simple, simple, simple. SuperStar can do so much more than simply scroll text. Images can move while at the same time special effects are added. Watch the video above closely to realize all the nuances keeping you engaged. SuperStar does all the work while you take the glory. Our sequence videos show the magic done with Cosmic Color Ribbons but you're not limited to that one design element. SuperStar doesn't care if it's talking to a Cosmic Color Ribbon, 16 channel light controllers or DMX channels. Just map the channels and let SuperStar do the rest. Don't have a creative bone in your body? Use SuperStar to build Instant Sequences. Click the "Roll Dice" button to get a random set of theme, color, and movement variations. How long does it take to sequence your favorite tune? Think seconds instead of hours.